A Village Sign at Lubenham in Leicestershire. You are looking for a 40 ml container. 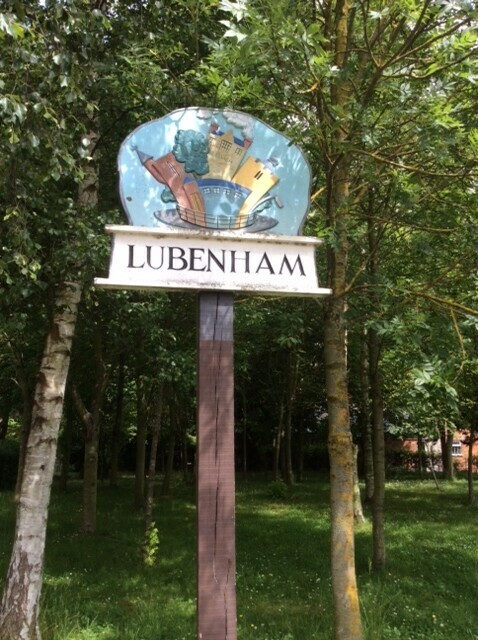 The main road that leads through the centre of Lubenham gives only a hint of what this pretty village has to offer. Turn down any of the side lanes and you will find what is a quintessential English village. Mentioned in the Domesday Book of 1086, Lubenham was divided into three fees that probably corresponded to the holdings of three earlier Saxon tenants. By the early 14th Century, the village had secured permission to hold two weekly markets and an annual fair at Whitsuntide. A striking feature of the village from the 16th Century onwards is the large number of freeholders with small estates, probably due to the early enclosure of open fields in 1600-01 and later in 1766. This is reflected in the number of medium-sized houses from these dates that can still be seen in the village. Situated in the rich fertile grazing land of the Welland Valley, agriculture and associated trades, such as blacksmithing and weaving, were the staple occupations of the village but during the 19th Century a thriving industry developed with the opening of the Perkins’ factories. The railway station opened in 1869 and closed nearly 100 hundred years later. In front of the Village sign are two benches with plaques on them. The Left hand one says Norman Prescott Taylor 19A5-19BC and the Right hand one says Tony Meacham 19D8-19EF.